What motivates the building of databases by scientific collaborations? In this paper, we argue that not only are databases being built to support scientific work per se, but also with the intention of performing a variety of social functions. 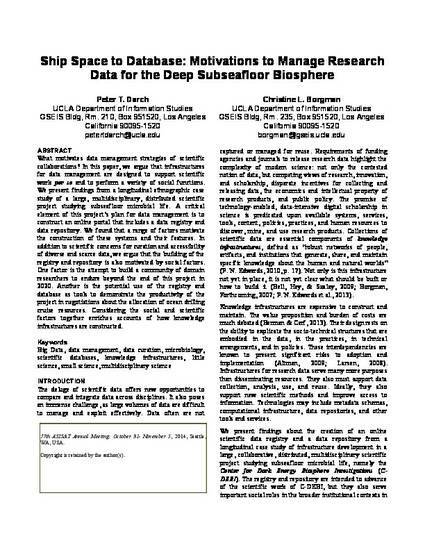 To explore this, we present findings from a longitudinal ethnographic case study of a large, multidisciplinary, distributed scientific project studying subseafloor microbial life. A critical element of this project’s Data Management Plan is the construction of a data portal. We found a range of factors motivating not only the very construction of this portal, but also the inclusion of particular features. In addition to scientific factors relating to improved curation and accessibility of diverse and scarce data, we argue that the building of the portal is also motivated by social factors. One such factor is the attempt to build a community of domain researchers to endure beyond the end of this project in 2020. Another motivation is the possibility of using the portal as a tool to demonstrate the productivity of the project’s scientific domain in negotiations about the allocation of scarce and valuable ocean drilling cruise resources amongst multiple, competing scientific domains. Considering the social factors, in addition to scientific factors, that motivate the construction of scientific databases enriches accounts of how these databases are built.